Back in May I wrote a post about the effort (or lack thereof) that goes into writing this blog. I won't repeat it, but if you want to read it you can find it here. It's about 11:30 PM Wednesday night as I write this. Thursday's post was all set. I got home late (for me) Monday and Tuesday night and I figured tonight I'd go to bed early. As is my habit, I turned on my computer and checked my e-mail before going to bed. Then I made a big mistake... I logged-on to eBay Motors. Halfway down the page was this car. I had to write about it. A few days ago I wrote a post about an NSU Prinz. In that post I mentioned that the first car with a production Wankel rotary engine was the NSU Spider. What are the chances one would turn up on eBay today? The car was based on the NSU Sport Prinz coupe, but had a grill in the front as the rotary engine was water cooled. The body, style wise, is somewhat bland and now looks dated, but it's not completely unattractive. 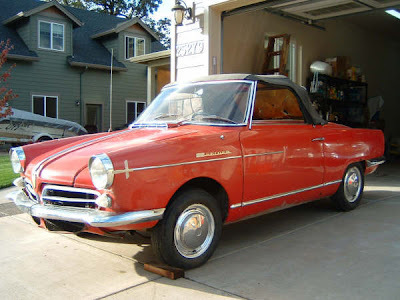 The NSU Spider was not a popular car in the US and only 200 or so were sold here when it was new. (The car listed in eBay is located in Vancouver, Canada, but is from Oregon originally) I have never seen one of these in person. The NSU Spider being offered on eBay is amazing in that it is a clean, untouched survivor. The seller claims the body is straight and rust fee. This would be a great restoration project. Click here to see the eBay listing for this NSU Spider. Jay Leno owns an NSU Spider and featured it on his Jay's Garage website. Click here to find it. PS - The car that was supposed to be Thursday's post will now be Friday's post... Unless of course I do something stupid like look at car listings before going to bed tomorrow night.